Throughout the modern era—and drawing on a long pre-history dating back to the mythical Garden of Eden—utopian visions of sustainability have suffused our culture. 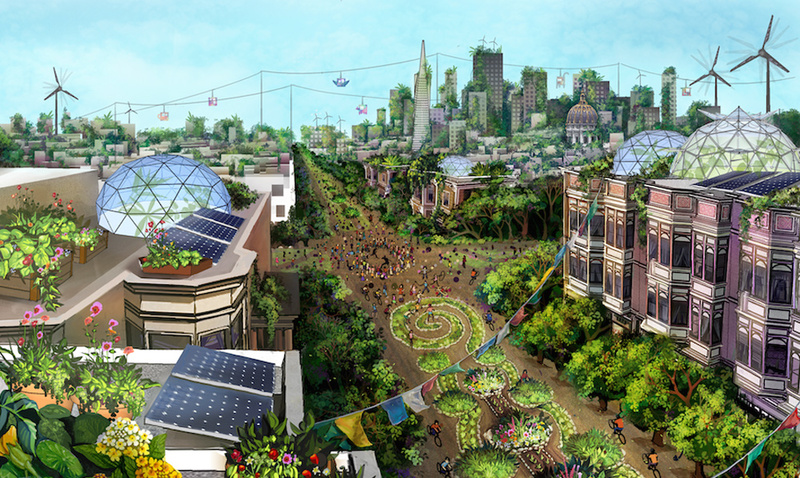 These visions depict a future world free from crisis, conflict, and want, and in which humans have found a way to live in harmony with nature. In all cases they present an ideal, even sacred landscape, whether wild or pastoral, urban or suburban. Their idealized qualities are presumed to be universal, a future world into which all should wish to enter. Yet like all utopias, they inevitably demarcate an inside from an outside, and reflect the particular histories and aspirations of their creators. Utopian sustainabilities have long been a fixture within popular culture, particularly in the realm of fantasy, futurology, and science fiction. They have been used as blue-prints for intentional communities seeking to prefigure a utopian future through sustainable approaches to architecture, agriculture, and forms of community. As elements of countercultural movements, they have inspired generations—in the 1920s, '60s, and today—to live, work, and think differently about their place in society and on the planet. California has provided particularly fertile ground for these imaginings. Iconic sites and regions of the state have served as a primary location for sci-fi utopias (and dystopias), for communes and intentional communities, and for countercultural seekers, activists, artists, and entrepreneurs hoping to build a sustainable world—as they understand the term.